This is a very old style of hair removal that has been gaining in popularity of late due to its simplicity and its hygienic nature. 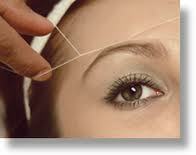 Essentially it involves using thread to trap unwanted hair in a type of mini loop, and then pulling the thread to capture the hair and pulling it out, roots and all. It takes quite a while to do as you can only do one hair at a time, though the results of this type of hair removal are impressive, often leaving an area free of hair for up to 6 weeks. This method is only useful for short-term hair removal and generally only works on fine hair. Friction involves using a glove that has sanding or smoothing properties on its exterior, to literally buff off the hair. It’s cheap and painless though is not to be used on the face, arms or bikini area, as it can be extremely irritating for the skin in these areas. This unusual hair removal method had been around for over a hundred years and involves applying a sugar-based paste onto the hair that you want removed. You can either buy pre-made paste or make up your own, with the main ingredients being water, sugar, lemon, cornstarch, and honey or molasses. To remove hair, dust the area with cornstarch then apply the paste in the opposite direction to the hair growth. Cover the paste with a strip of porous towel or a piece of paper, pressing down lightly for a few seconds, before quickly ripping it off in the direction of the hair growth, taking the unwanted hair with it. A natural hair growth inhibitor, tumeric has long been a part of hair and beauty techniques in India. Depending on your age, and the type and density of hair, turmeric can prove extremely effective when applied in the form of facial scrubs or beauty masks, though it often takes multiple applications to see gradual results. Using a chemical depilatory to remove unwanted hair involves applying a mixture, which helps to break down the root strength of the hair, allowing it to be simply scraped off after a period of time. The main ingredient in the mix is calcium thioglycolate, and the best areas to use depilatories on are the arms and legs, as the mixture can sometimes irritate sensitive skin elsewhere. Choosing the right hair removal method generally comes down to finding one that won’t irritate your skin, while still being effective at removing the hair. If you are tired of shaving or waxing, maybe it’s time to give a new hair removal method a go. lol, we used to do the thread as kids. Luckily for me, i don't have a lot of hair.